Such claims get repeated seemingly every January at CES when new televisions roll out, with promises of tremendous, blazing new visuals to come. But this protracted war to create the sexiest television in the world may be getting a little hard on the eyes. It is not enough that manufacturers chase ever loftier standards for high-end displays. Ultra HD television, with more pixels and bigger screens, is desperate to go mainstream as the new standard because standard HD is so passé. Rival technology formats are also being pushed by competing companies to win that coveted space in consumers’ living rooms. On the battlefield is organic LED (OLED) technology, championed by LG Electronics, facing off against something called quantum dot, a nano-crystal evolution of LCD technology which Samsung favors. This may sound like jargon and splitting hairs, but the production methods and potential costs for each type of display are very different. Furthermore, this fight for dominance is not likely to be over any time soon. The newish competitor is quantum dot technology, which Samsung claims can generate visuals that rival OLED screens. Moreover, quantum dot material can enhance lower cost LCD display manufacturing lines with a few adjustments. OLEDs have traditionally been more challenging to make, which contributed to their slow arrival to production model televisions. “We believe quantum dot is the future of display technology,” said Joe Stinziano, executive vice president of the consumer business division at Samsung Electronics America, based in Ridgefield Park, NJ. During his company’s press conference at CES, he touted the color range and ability to generate realistic images with quantum dot screens. In the corner for OLED remains LG Electronics, who at CES 2016 presented its new G6 Signature television at a press conference. The G6 is designed to essentially be a picture on glass that measures 2.57 millimeters thin. That is about the depth of four credit cards stacked, said David VanderWaal, vice-president of marketing with LG Electronics USA in Englewood Cliffs, NJ. 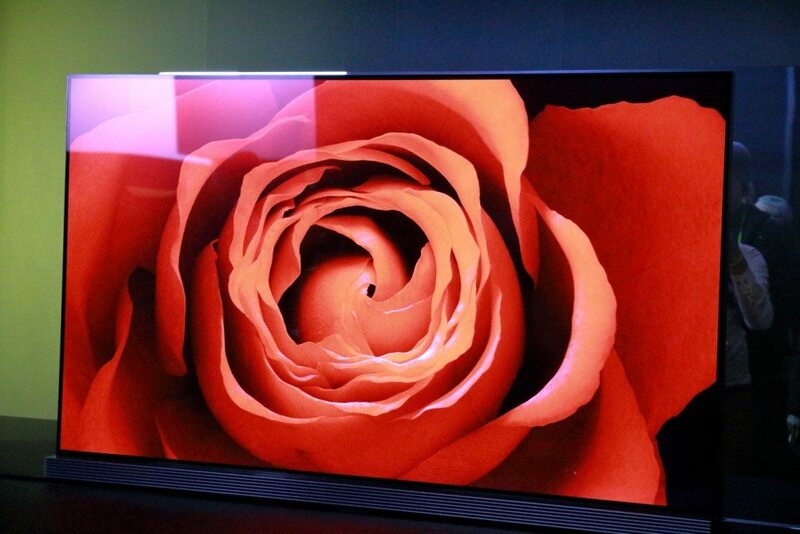 OLED technology does not require backlighting for its display, allowing televisions and other electronics with such screens to be built with very narrow profiles. Speakers and other circuitry are built into the G6’s stand to slim it down further. Screens built with OLEDs can also be flexible and are highly energy efficient. LG even developed a prototype OLED television screen that can be rolled up like a newspaper. Despite such a boast, these new breeds of high-end televisions, OLED or otherwise, will need content to be relevant. Hollywood studios this year plan to release more than 100 movies, such as Mad Max: Fury Road and The Martian, in the Ultra HD Blu-ray disc format for home viewing. But this not the first time a new class of television was hyped to the public, and likely will not be the last. Similar fanfare once surrounded 3D televisions, which never became the breakout hit manufacturers hoped for—and quietly faded into the background. If consumers do not take a shine to Ultra HD televisions, all the fuss between OLED and quantum dot technology could be for naught.